About eighteen months ago, I usually knew where things were at any given moment. Now there are (mostly) delightful surprises lurking everywhere. And I wouldn’t change it for anything. The most amazing development the past few months has been in your ability to communicate. All of a sudden, you actually say words and phrases we understand and we can answer you! We’ve actually had a few conversational exchanges. You also mimic most words you hear. So far, this has not been a problem. It is just adorable and hilarious. You just learned how to say, “Why?” You also know how to say “hello”, “night-night”, “kitty cat”, “shoe”, and “meow”. You have a few funny exclamations in your arsenal “Oh, my!”, “Oh, no”, and “Oh, shoot” among them. In fact, every time we do anything that displeases you lately you say, “Oh, no, no, no” in the most pathetic voice. You say so many cute, funny, smart things. You amaze and amuse us constantly. You learned how to kiss about a week ago. We ask you to send us a kiss and you make a kissing noise with your mouth. Funnily enough, when we actually get you to kiss us, you still do the open-mouthed toddler kiss. Either way, we can’t get enough. You are walking up a storm. You started at the beginning of December. You’re not running yet, but you tirelessly toddle everywhere and hardly ever are still, unless you are in your booster seat, your crib, your carseat, or standing right in front of the TV. You love to watch “Sesame Street”, “Max and Ruby”, “Yo Gabba Gabba!”, and “The Biscuit Brothers”. I have been sick all week and you started running a fever yesterday, but that hasn’t stopped us from having a memorable week. 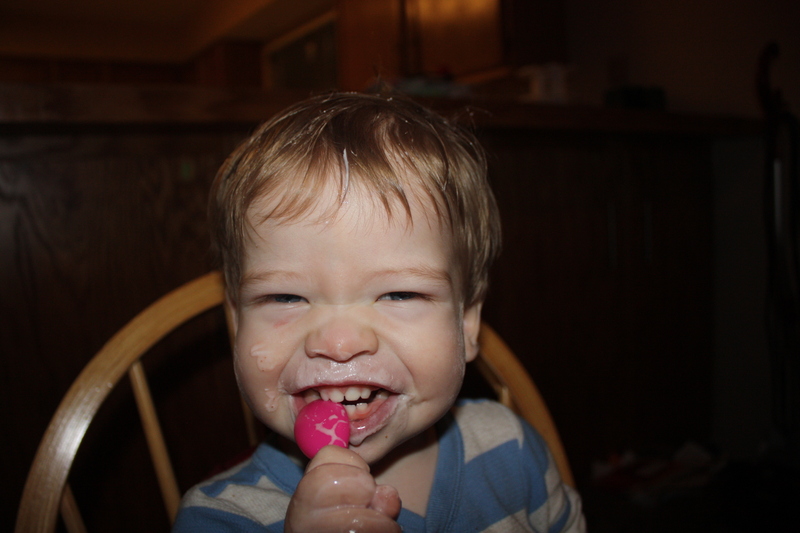 On Monday, I let you experiment with an almost full container of Yo Toddler yogurt. I don’t know what possessed me, because I have never let you do that before, but it suddenly seemed like a good idea. I’ve worried that I am too careful and am holding you back from learning to feed yourself as fast as you otherwise might. I don’t know how much you learned from this session, but it sure was fun. You had a BLAST. We both did. And it reminded me that we need to let loose and explore and make a mess every now and then, because it is so much fun and it leads to more fun at times. In this instance, it led to us taking a bath together in the big bathtub in Mommy and Daddy’s bathroom. We hadn’t done that in months. And I am so glad we did. Once again, we had a blast. You discovered that it is awesome fun to hold your hand right under the faucet while the water is running and spray water all over the bathroom. And my heart melted when you gazed up at me and smiled adoringly while I was washing your hair. We broke from our routine last Monday and had one of our happiest mornings in recent memory, despite the fact that I felt sick as a dog. Making you happy made me so happy. I hope I can remember to break the routine and the rules a little more often and experience the crazy side of life with you as much as possible. Here’s to eighteen months of life outside the womb for you, Max, and eighteen months as parents for me and Daddy! Eighteen months as a family! What an achievement! I am so proud of us and of you. I love you, sweetheart.